We had some friends over for brunch and Josh asked if he could make an egg CASSEROLE. AGGH! That word again:) I didn’t like the idea at first, but after he explained what he wanted to make, I was all for it. He basically made a frittata, except it was in a 9 by 13 pan, in the oven. 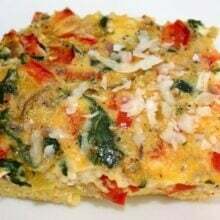 He used eggs and veggies-onions, red and yellow peppers, tomatoes, and spinach. He also added in some mozzarella cheese. He whipped it up in a hurry and it was actually really pretty when he pulled it out of the oven. 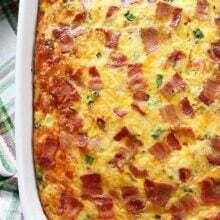 If you are having company for breakfast or brunch, give an egg casserole a try! It’s easy and will feed the masses! And I guess I should give casseroles a break, they aren’t that bad after all. At least this one wasn’t! 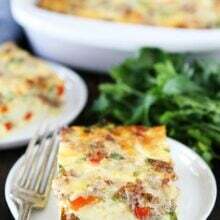 We love this Egg Vegetable Casserole because it feeds a crowd! In a large bowl, whisk together the 18 eggs. Add a splash of milk. Add salt and pepper to taste. We also used Spike seasoning, 1-2 teaspoons. If you don't have this, try Italian seasoning instead. In a large skillet, saute the peppers and onion in a little bit of olive oil. Add in the spinach for a minute or two. Pour the eggs in a greased 9 by 13 Pyrex dish. Add in the sauteed veggies and tomatoes. Stir everything in the pan. Stir in mozzarella cheese. Make sure everything is distributed evenly. Bake in a 350 degree oven for about 35-40 minutes or until the eggs are set and golden. Sprinkle the casserole with Parmesan cheese if you wish. I was looking for a recipe to make for a friend who is has a houseful of company and I wanted to help her out with breakfast tomorrow morning. This recipe is just what I was looking for! thanks for the pics to inspire me. Will look and taste great! You are welcome! Enjoy the breakfast! I made this today for a pot luck, and they ate it all. I didn’t have mozzarella, so I used 1 C no fat shredded cheddar, and I used Mrs. Dash tale blend instead of Spike. I was looking to cut some of the calories so I used 12 eggs and 1 C egg substitute. I can see lots of possibilities for substituting what vegetables are in season, and using different types of seasonings and cheeses. This was easy to prepare, and I loved the color provided by vegetables. This is a keeper! The recipe is very versatile. Glad you enjoyed it! This is beautiful and just what I’ve been looking for! Can it be assembled and refrigerated the night before baking? Yes, you can assemble it the night before and baking the morning. This is awesome! Can you reheat it or does it need to be eaten right away? Made this last night for Easter dish…… baked this morning. Worked great to make night before. I did take it out 30-45 min before baking (seen that on other recipes). And I did the veggies a little diff. Green onions, whole red pepper, more tomatoes and the spinach. and 14 eggs instead. All worked great, I think you can switch it up any which way. Also added chopped fresh basil over the top after removing from the oven and it was wonderful and we got compliments from our guests. And they were comparing to one I made for a bday party two wks ago and said this one’s the keeper. Yum, yum! I’ve made similar breakfast casseroles before, but this had a different flavor. Hubby and I have four backyard hens, which means we get four eggs a day. Even though we are often giving the eggs away, we always seem to have an over abundance, so I’m always looking for egg recipes. The changes I made were basically because I didn’t have all the ingredients on hand. I exchanged a dollop of low fat sour cream for the milk and frozen thawed and drained collards for the spinach. I added garlic to the saute mix, as well as a small amount of chopped jalapeno to kick it up a notch, and a couple of chopped sun dried tomatoes. I also halved the recipe, and baked in an 8×8 pan, since it was just hubby and I and the two dogs partaking in the meal This recipe is a keeper! About how many servings would you say this casserole make? Great recipe…plan on making soon to try for a Christmas brunch for my friends. I am from Maryland and never heard of spike seasoning. I’ve heard of Laury’s seasoning. What would be an alternative that I would be able to find in stores? Italian seasoning, maybe? Thanks! Italian seasoning would be great! Enjoy! What is the calorie intake per square approximately? If not served immediately does it go flat or does it look decent after transporting it? I am on the Vashon diet for inflammation and can’t eat dairy so no cheese but who cares! It was yummy and dairy not. I added sun dried tomato and left veggie pieces fairly large. Looked great too. I loved it. Used frozen spinach and added fresh mushrooms, it was wonderful. I made this today for Easter brunch. Excellent! Everyone liked it, even the kiddos. Could you add hashbrowns to this? If so, would you recommend frozen or refrigerated? Any changes to the rest of the quantities? Thanks!! Made this for my girlfriends on the last day of school breakfast. It was wonderful. Everyone wanted the recipe. I am a mom of 3 boys and I ran out of meat to use for dinner tonights. 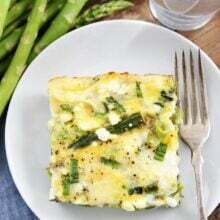 I happened to have 2 cartons of eggs and plenty of veggies so I googled egg and vegetable casseroles. This was perfect! Can this be made the night before, then refrigerate? but can it be made the day before. I would make it Saturday morning 10:00 am and serve it the next day around 11:00 am. Is that too long to be refrigerated completely prepared ..except for the baking part? can i make this with egg whites? will it work out well? 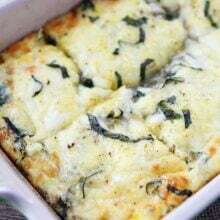 been looking for an egg casserole and this looks great just wondering if using egg whites will let it rise correctly? Can this be frozen? I’m preparing for an after wedding brunch and would like to make it a week or two in advance, then put in the refrigerator for a day or two before baking. Would you bake it before freezing and then just reheat? Cool completely and then freeze. Defrost and reheat! Sounds good. Can you make this ahead of time and sit overnight? Thanks. I prepped this last night and baked it Christmas morning! We really liked it! I also managed to find the Spike seasoning at a local grocery store so used it just as the recipe called for…we enjoyed it! Yes, skim milk will work. Spike seasoning is at most stores, if you can’t find it you can use Italian seasoning. Looks yummy! Has anyone had success with less eggs? 18 seems like many! How many eggs would work for a 9 x 9 size of this? Can you bake it in a crock pot or slow cooker? I haven’t tried it in a slow cooker! Can you bake it in a crockpot or slow cooker? I have made this recipe several times, first time with the 18 eggs, next time, I only had 12, it doesn’t matter. I do not precook anything, you don’t need to, unless its large chunks. I’m diabetic, I added a can of tuna or salmon, saving the liquid to use instead of the milk. I just layer the onion, next items frozen: Hatch, NM green chile, green & red peppers, spinach & kale, then stir it up carefully. Also, used salsa instead of tomatoes & a combination of spices I have on hand. If I make this for 4 servings, will 6-8 eggs be enough? Is 18 eggs an error? No, it makes a large 9×13 pan. I love this recipe and use it frequently as a base for my weekly breakfasts. I prep my meals on Sundays, including making 5 breakfasts that I can microwave at work each morning. I use this recipe every few weeks and have some tips for those who want to make it ahead for reheating later. First, make sure the veggies you are using don’t retain a lot of moisture. For example be sure to properly sweat the moisture out of mushrooms, zucchini, etc. Never use frozen spinach if you are planning to cook it ahead of time. The less moisture your veggies have in them, the better it will reheat. Second, I leave the cheese out when I cook it in advance. I find that the cooled, then reheated cheese within the casserole gets rubbery. I just carry some cheese with me in a small container and sprinkle it on top when I reheat. Microwave the casserole first, sprinkle the cheese on, then microwave for a few more seconds. If you want the cheesy taste to be within the casserole but without the rubbery-ness that comes from reheating, you can add nutritional yeast to the egg/veggie mixture. Just be sure to adjust the salt as the yeast has a salty flavor. I actually don’t use any added salt in the recipe but always use the nutritional yeast instead. You can also substitute sun-dried tomatoes for fresh to cut down on moisture. I find these tips make this a good casserole to make ahead and eat off of during the week. If I wanted to add hashbrowns or potatoes, would I need to change anything up?